Don’t be the one who bets on that shooting percentage spike being sustainable. 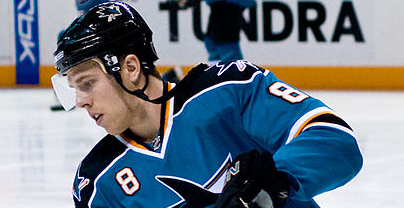 Pavelski’s average draft position (ADP) in ESPN drafts is 20.4. The Avalanche’s Semyon Varlamov posted a 0.927 SV% last season. His previous five seasons: 0.912. Is that a deviation from his true value, or the 26 year old figuring something out? It’s not a glowing endorsement. Besides Varlamov himself, the goaltender may see less goal support as his teammates’ 8.59% SH% in 5-on-5 close situations (2nd in the league) could be due for a step backwards. 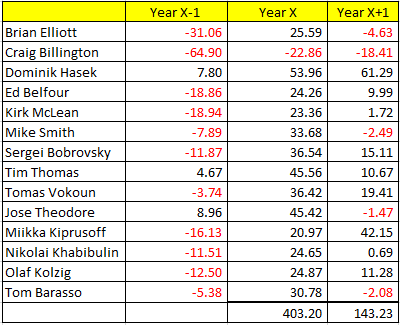 Less goal support means less wins for Varlamov (and you if you don’t heed my advice). Varlamov’s ADP in ESPN leagues is 37.6 — 7th among goalies. Take a flyer on Cory Schneider or Kari Lehtonen instead. 2013-14 brought new career highs in goals and assists for Ryan McDonagh. Among his 14 goals were 2 empty netters and these two beauties. 19 of his 29 assists were of the secondary variety, which carry little predictive value. Also working against McDonagh is his supporting cast. Along with his defense partner, Dan Girardi, McDonagh gets tough shift assignments. He did last year too, but the Rangers have downgraded their bottom-six, which play a lot with McDonagh-Girardi, meaning he could be spending slightly more time in the defensive zone, which goals are rarely scored from (the above video shows the exception). McDonagh’s ESPN ADP is 98.8. While Joe Pavelski had a big jump in goals explained mostly by an increase in shooting percentage, Joel Ward actually tops him in this regard. In fact, Ward leads all NHL players with 9.7 goals explained by his 2013-14 shooting percentage increase over his previous two seasons. I don’t know if any of you are in leagues deep enough to actually consider Ward, but don’t regardless. Steve Mason’s 0.917 SV% from last season wasn’t incredibly impressive in itself — just three ticks above league average– but it’s a drastic improvement from previous years. In his career before 2013-14, Mason’s SV% is 0.905. 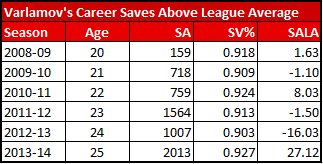 Between his Calder season of 2008-09 and his 20 game 2012-13 season, Mason had three straight seasons with save percentages of 0.901 or lower. While many will suggest that Mason re-discovered himself after his move to Philadelphia, I’m slow to label this as such. While that can happen, far more frequently its a deviation that corrects itself over the long term. Mason’s ADP is 99.8 in ESPN drafts. It’s kind of like, not necessarily “avoid”, but bump them down your list, yeah? Yeah. I thought “Five Players on which to Exercise Skepticism for your Fantasy Draft” was a little clunky. Doesn’t roll off the tongue. Glad to see I avoided all of them (my draft was last Sunday). Was gonna say, Pavelski should still be a very productive player even when you regress his shooting %.